H.E. Thomas Schieb is an Ambassador to Serbia since 2018. He earned his Master’s degree in Economics, University of Göttingen, Germany in 1992. He was in diplomatic training in Bonn until 1994 when he was deployed as an EU election observer to South Africa. 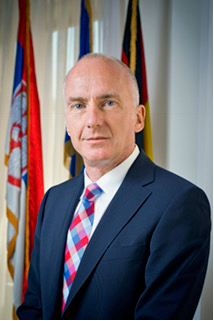 He served in Task Force Bosnia as a desk officer in Foreign Office in Bonn (1994 – 1996). His diplomatic deployment included German Embassy Sarajevo (1996), German Embassy Dar es Salaam (1996-1998), Division Southern Africa, desk officer, Foreign Office, Bonn (1998 – 1999), Division Security Policy, desk officer, Foreign Office, Berlin (1999 – 2002), Counsellor, Political Department, Permanent Mission to the EU, Brussels (2002 – 2005), Spokesperson, German Embassy London (2009 – 2011), as well as service as Deputy European Correspondent in Foreign Office, Berlin (2005 – 2009), Head of EU Coordination Group, Foreign Office, Berlin (2011 – 2014). Before post in Belgrade he was a Minister Plenipotentiary / Political Coordinator, Permanent Mission to the UN, New York (2014 – 2018).